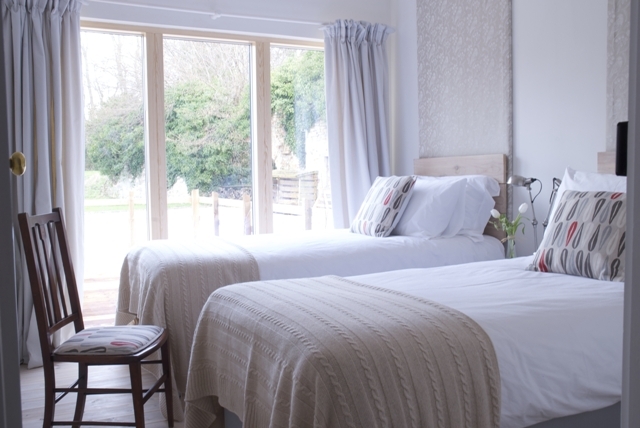 The Stables was refurbished in 2014 to provide self-catering accommodation for up to 4 adults (and a baby in a cot). A large open-plan living space offers ample seating with a large 46" flat screen TV, iPod dock (cunningly disguised as a retro radio) and of course, WiFi. A brand new, well equipped kitchen has everything you could possibly want to create a feast – and after a visit to the delectable farmers’ market in Wells, you may well want to! A stylish zinc-topped dining table completes the picture. There are two double bedrooms, one with a king-size bed and one with two singles (which may be pushed together to create a superking). Bedrooms are imaginatively furnished with hand-printed walls and bespoke lampshades. 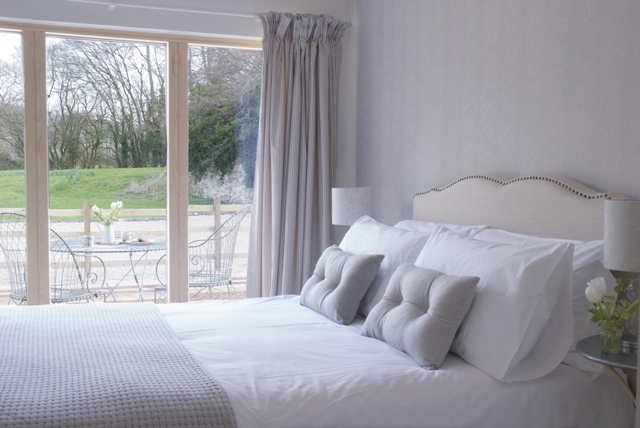 Beds are supremely comfortable, with pocket sprung mattresses and crisp, white 100% cotton bed linen. There is a modern family bathroom containing a bath with a shower over, underfloor heating plus fluffy cotton towels and handmade soaps. A second bathroom, which boasts a large walk-in shower, is for guests exclusive use in the winter (by request, for parties of 3 and over), but is used as the communal pool shower room during the summer months. The Stables is situated to the rear of the main house and has stunning views over the surrounding countryside. Guests have sole use of a private decked patio area containing seating and BBQ facilities. The cottage is all on one level so is suitable for everyone, although there is a small step up to the front door. In the summer, we offer guests shared access to the 12m heated outdoor swimming pool, situated in a walled courtyard, between the hours of 11am and 6pm. We tend to open it for the May half-term week and close it at the end of August (weather permitting). The pool opening hours and dates are weather dependent and use is entirely at guests’ own risk. Towels and linen, Hairdryer, Flat screen 46" TV with Freeview and DVD player, DAB radio and iPod docking station, free WiFi, small selection of books, games and DVDs, Garden furniture and BBQ from April, Washing machine, Dishwasher, Microwave and Fridge/Freezer. High chair, travel cot and changing mat are also available, on request.